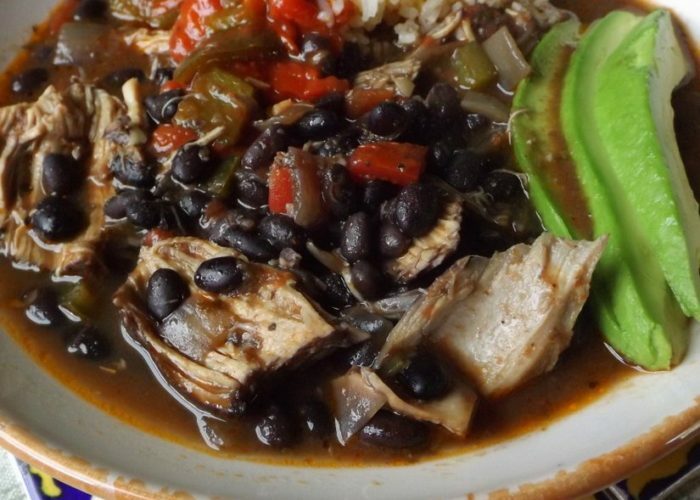 This truly is a no fuss, hearty chicken and black bean meal that could satisfy a crowd. With hints of smoky flavor and zesty salsa to top it all off, you will come back for seconds! 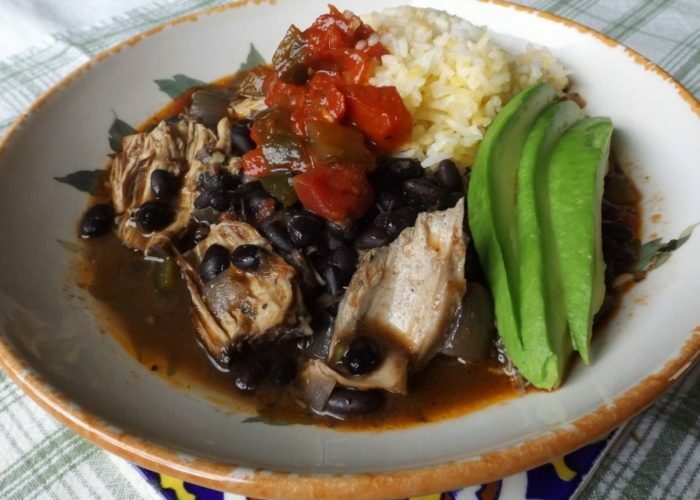 This recipe for smoky chicken and black beans reminds me so much of those delicious gumbo recipes that I love. 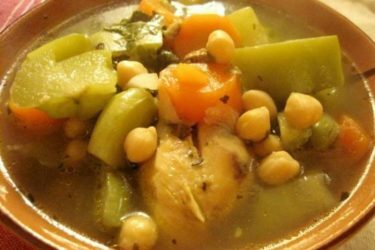 A cross between a soup and a stew served with steamed rice and zesty salsa. If you have never cooked dried beans before, this is a good way to start. Let the slow cooker work to your advantage. With minimal soaking time, this recipe yields tender black beans and chicken filled with smoky flavors. Cover the black beans in water and let them soak while you prep. Preheat 1/4 cup of oil for 3-5 minutes at medium heat in a large skillet. Season the chicken on both sides with salt and pepper. When you are ready, sear and brown the chicken pieces for 4-5 minutes per side. To the bottom of the slow cooker, add ½ of the diced onions, 1/2 the garlic, 1/2 the serrano, cumin, oregano, epazote, water, ham hock and 1 can of the fire-roasted tomatoes. Turn slow cooker on high. When you are done browning the chicken, remove skillet from heat. Drain the black beans and rinse well. Transfer beans to the slow cooker. Add the chicken pieces, making sure they are mostly immersed in the liquid. Add the fresh cilantro. Cover and cook on high for 4 hours or until the beans are tender. In a skillet, preheat 1-2 tablespoons of oil to medium for a few minutes. Add the remaining onion, serrano, garlic and poblanos. Season lightly with salt and pepper and saute for 5-6 minutes. Add the fire roasted tomatoes. Cook at a simmer for 7-10 minutes. Reseason to taste with salt, pepper, cumin and oregano. Reserve this salsa for garnish. 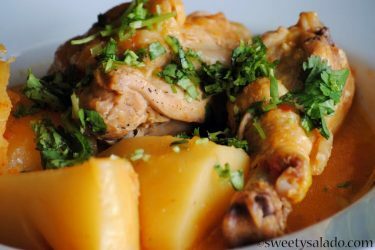 When ready, remove the chicken pieces from slow cooker onto a plate. Also remove the cilantro. Taste the broth for salt. Remove all the meat from chicken and add back into the slow cooker. Discard bones and skins. Cook for another 15-20 minutes. Serve with rice. 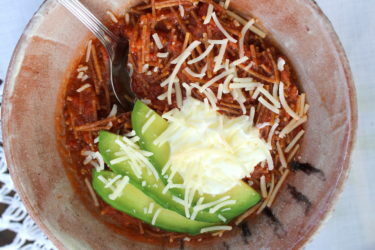 Garnish with salsa and avocado. If you cannot find smoked ham hocks in you market, look for ham flavored bouillon or soup base. This will add that delicious smoky flavor to your favorite soups and stews. During the winter when tomatoes are not in season, make sure to stock your pantry with extra cans of fire-roasted tomatoes.